8:20 Monday morning was when the house fell down. Sounded like it, anyhow. Lucky she wasn't underneath at the time. Three long hours he'd spent putting up that blinking shelf. Day of rest?! Red wall plugs, 6mm bit. Except he only had a 6.5mm jobby. Drill had a mind of its own. Seemed OK once he'd padded out the crumbly voids with snapped cocktail sticks. 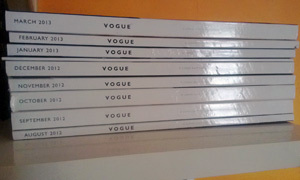 Should hold daughter's Vogue collection. Brown wall plugs next time.